See my Story Time for the next episode: “Annie!” Later King would recall the spray of blood on the wall; watching it trickle; the gun where Annie had dropped it; their son whimpering in the corner. 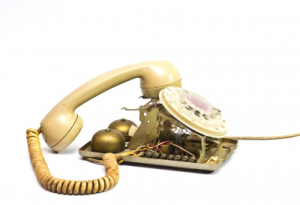 Broken Telephone is a party game we played in my youth. The purpose is to whisper a message person to person until it is spoken aloud by the last in line. The game makes fun of poor listening and language skills. For it to be effective, the final version of an original sentence should bear some resemblance in structure, but mean something hysterically different. Invariably the outcome fails to inspire a belly-aching response, because people don’t get the point or follow the rules. Often a smart-alec mucks up the game by inserting a different m essage or hi-jacking the original completely. Others think the challenge is to speak so that the receiver cannot get the message.